Romans, countrymen, and lovers! 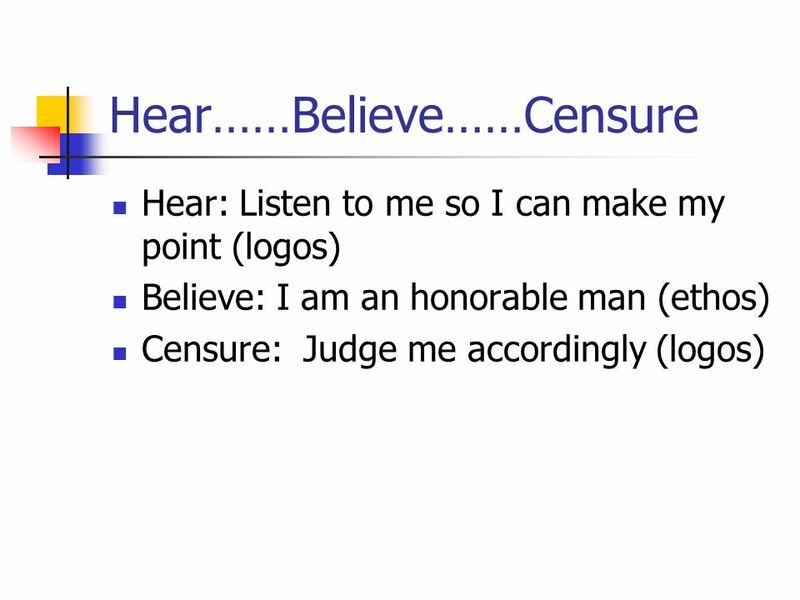 Hear me for my cause; and be silent, that you may hear: believe me for mine honor, and have respect to mine honor, that you may believe: censure me in your wisdom; and awake your senses, that you may the better judge. any dear friend of Caesar’s, To him I say that Brutus’ love to Caesar was no less than his. 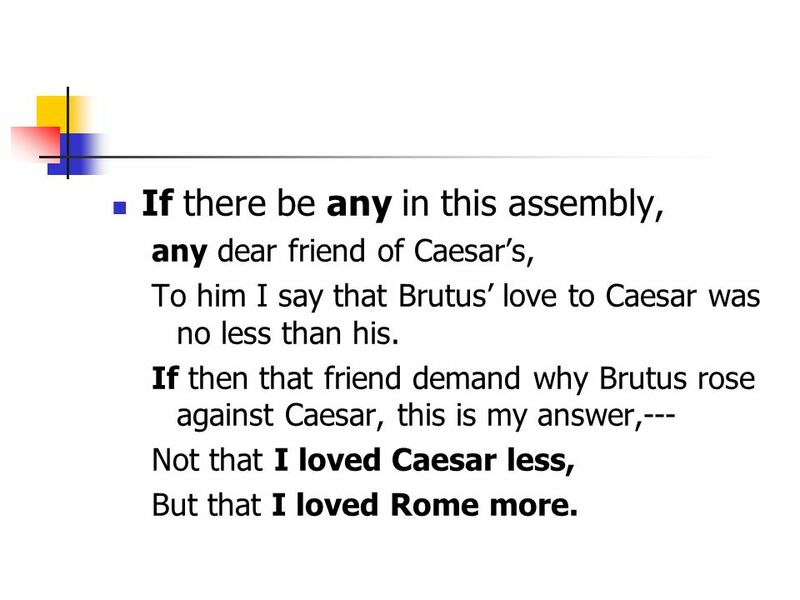 If then that friend demand why Brutus rose against Caesar, this is my answer,--- Not that I loved Caesar less, But that I loved Rome more. 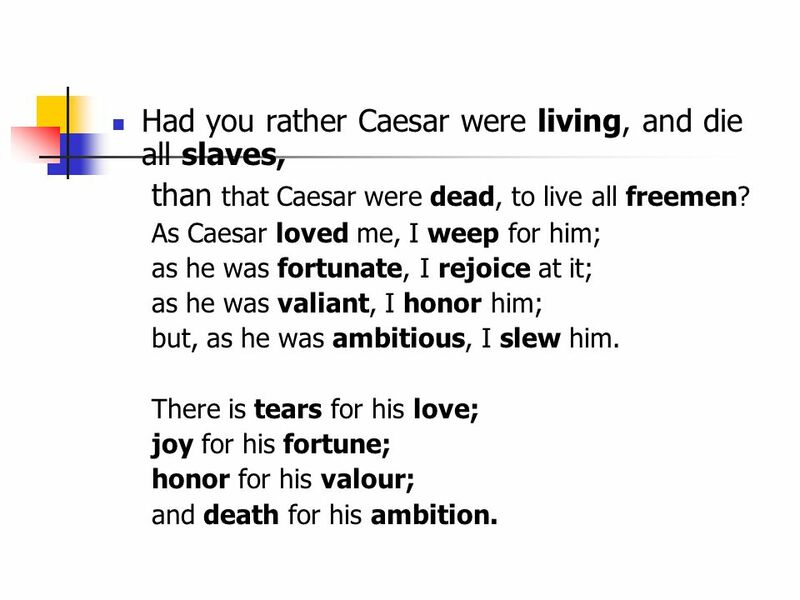 than that Caesar were dead, to live all freemen? As Caesar loved me, I weep for him; as he was fortunate, I rejoice at it; as he was valiant, I honor him; but, as he was ambitious, I slew him. There is tears for his love; joy for his fortune; honor for his valour; and death for his ambition. 6 What does Brutus want? 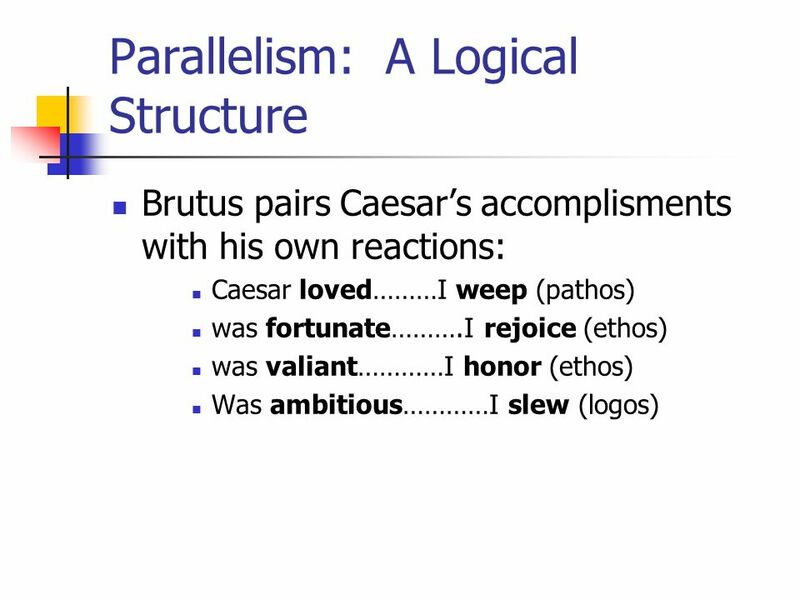 He wants the crowd to know that he loved Caesar— Repeats this concept in almost every line Always pairs Caesar’s positive traits with his sympathetic reactions Pairs Caesar’s negative traits with his own righteous actions—his honor, in effect. 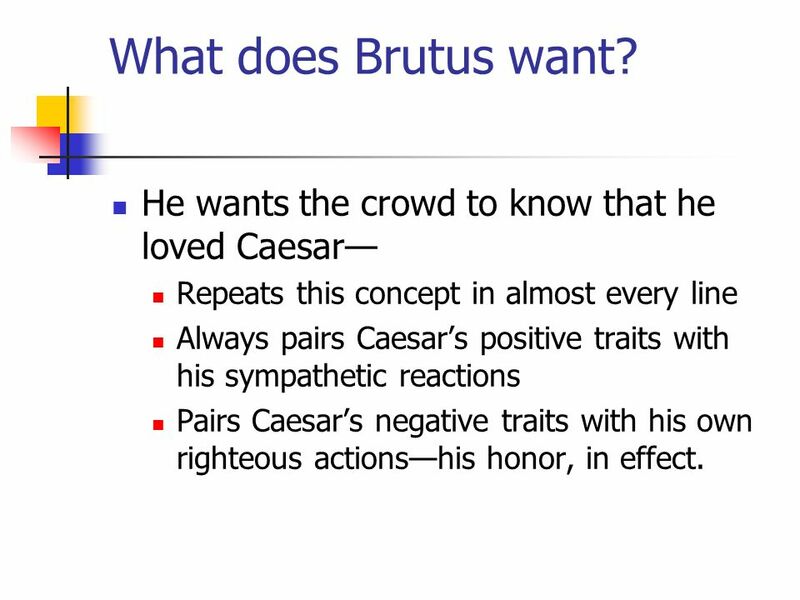 7 What else does Brutus want? 8 Brutus’s appeal Logos: excellent (Not that I loved Caesar less, but that I loved Rome more) Ethos: adequate (There is tears for his joy…..) Pathos: ??? 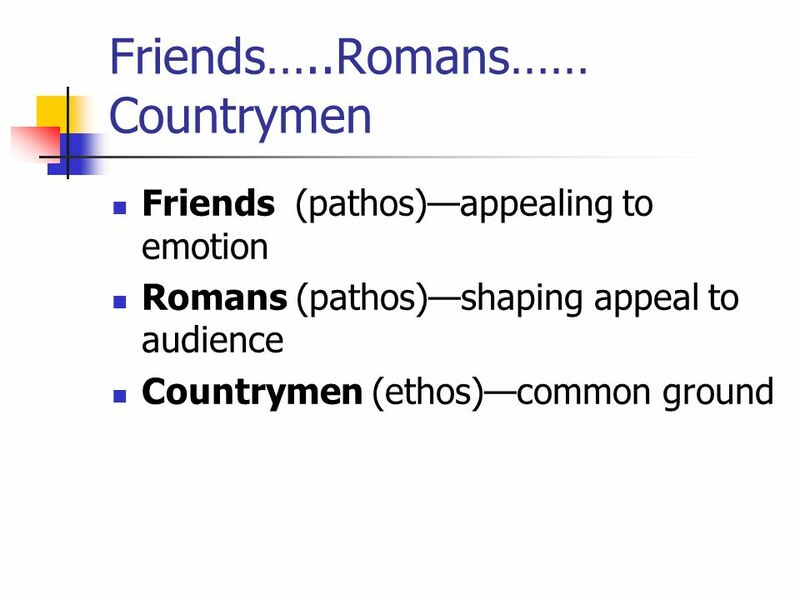 Brutus opens his speech with “Romans, countrymen, and lovers (ie friends).” What does the order of these words say about the importance he places on each? 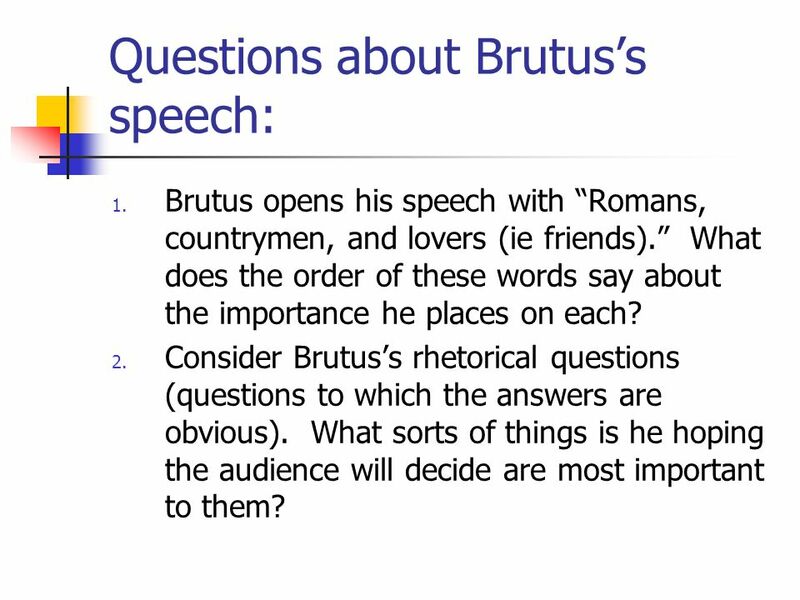 Consider Brutus’s rhetorical questions (questions to which the answers are obvious). What sorts of things is he hoping the audience will decide are most important to them? 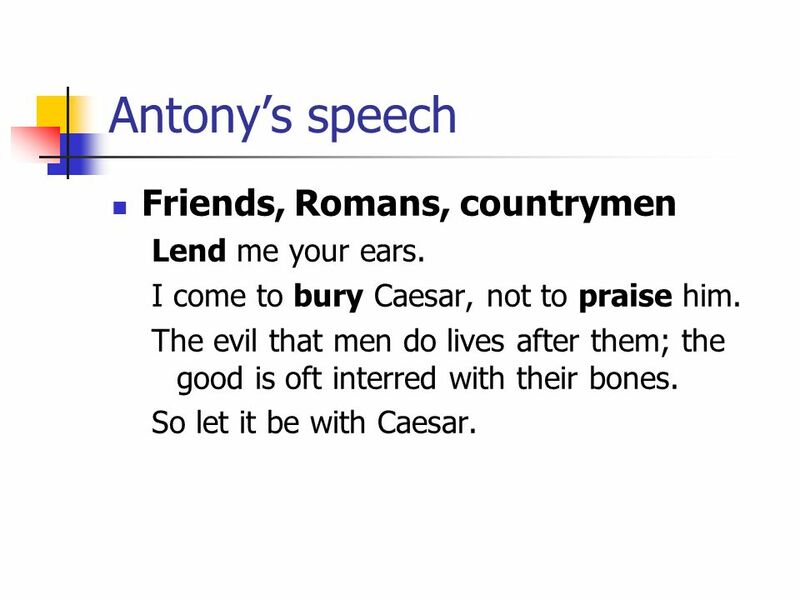 10 Antony’s speech Friends, Romans, countrymen Lend me your ears. I come to bury Caesar, not to praise him. The evil that men do lives after them; the good is oft interred with their bones. So let it be with Caesar. 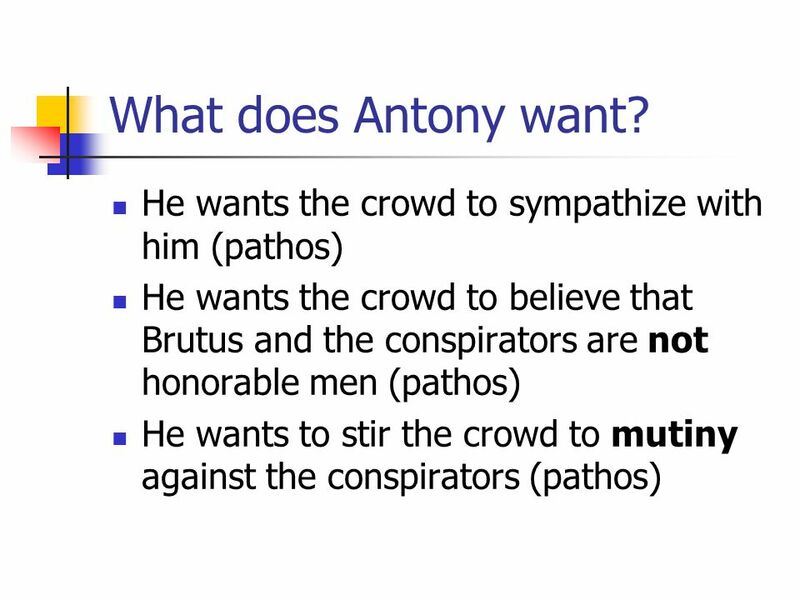 12 Antony’s continued The noble Brutus hath told you Caesar was ambitious. If it were so, it was a grievous fault. And grievously hath Caesar answered it. 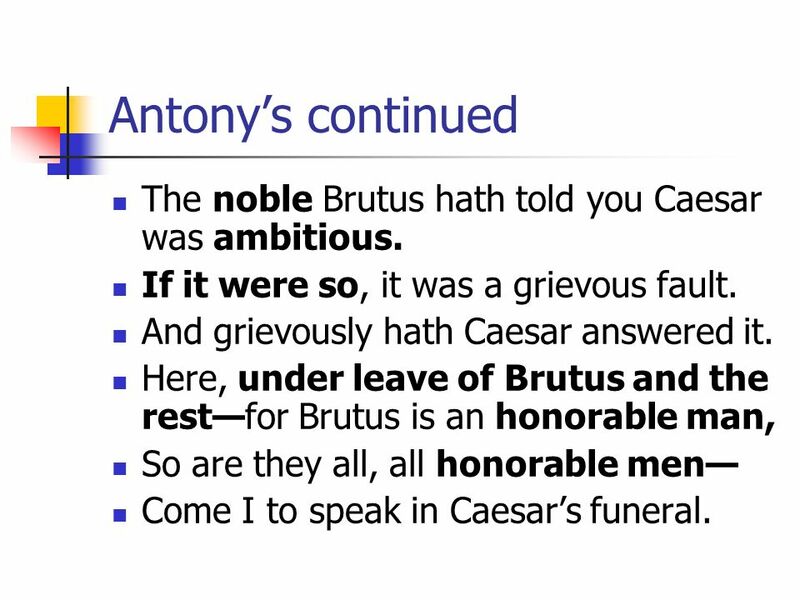 Here, under leave of Brutus and the rest—for Brutus is an honorable man, So are they all, all honorable men— Come I to speak in Caesar’s funeral. 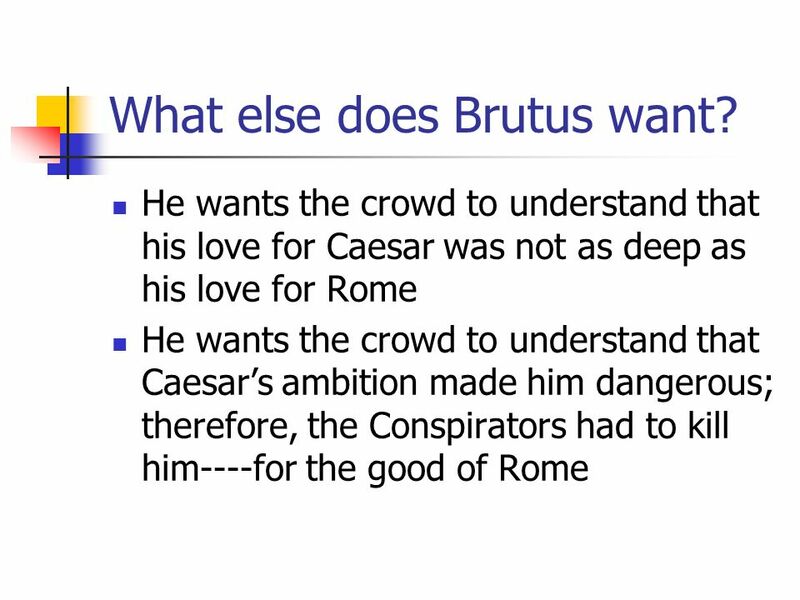 But Brutus says he was ambitious, (logos?) 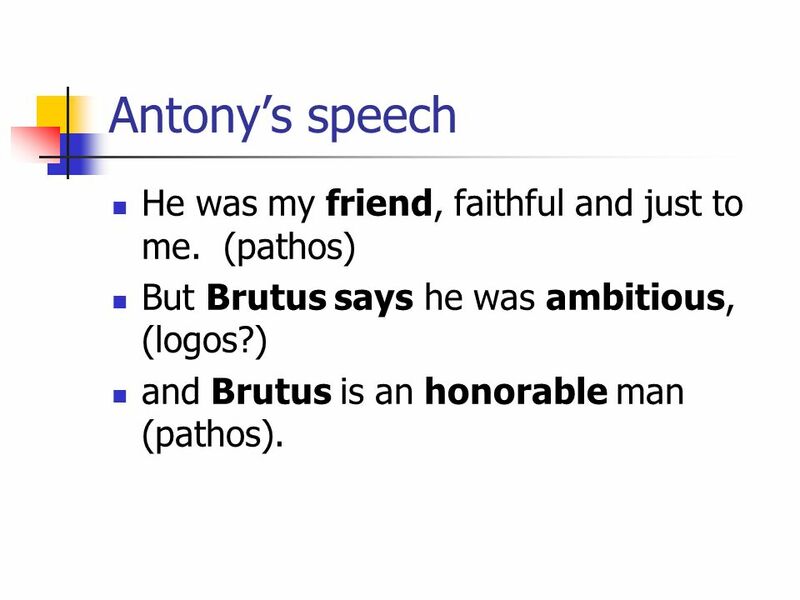 and Brutus is an honorable man (pathos). 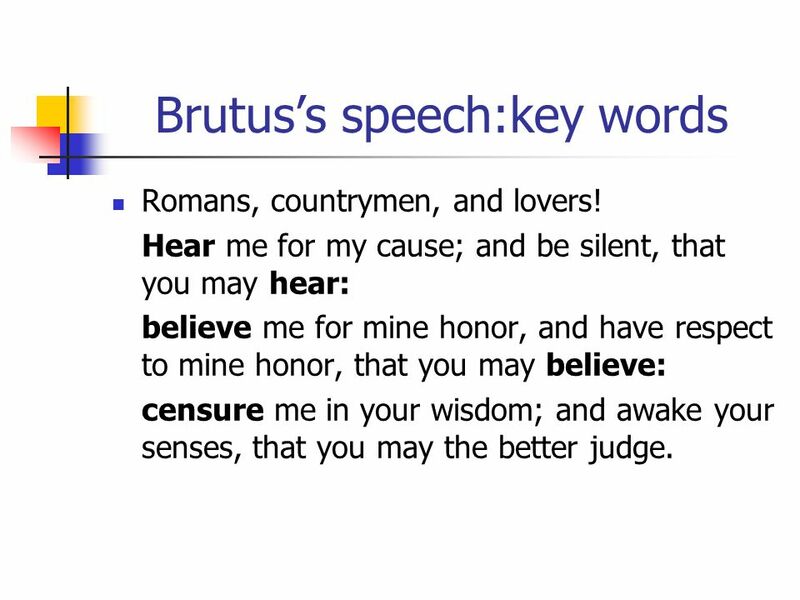 Download ppt "Brutus’s speech:key words"
Speech writing A guide to speech writing and great speech writers. Christchurch primary school 2006. 10/18 Write Now: Friendship is a major theme in the play. Explore this theme by answering the following questions: How far would you go to stop a friend. Question 1: Which of the seven propaganda techniques is employing in the underlined segment? 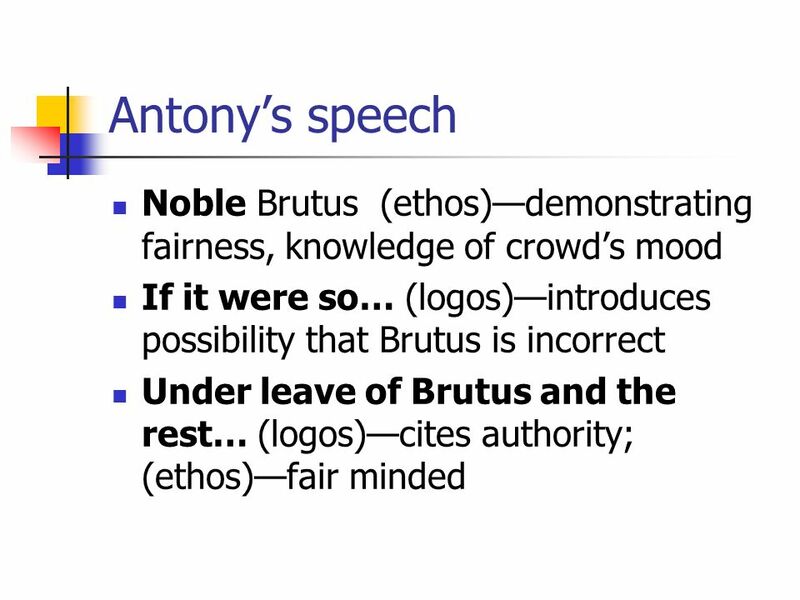 ANTONY Friends, Romans, countrymen, lend me your ears; I. Date Persuasion Techniques: Logos, Pathos, and Ethos. THE DECLINE OF THE REPUBLIC Mass of unemployed landless men allowed for the rise of ambitious men No trust in Senate to resolve the issues Romans were. Disdain, indignity injured merit, impairment shame fixedness (of will, mind) repentance conscience remorse despair (annihilation of hope) gratitude, (in)capacity. Peace in Persecution. Acts And when the dissension became violent, the tribune, afraid that Paul would be torn to pieces by them, commanded the. 1) Do not shout out answers! 2) This is your study guide, so you should write down questions and answers. You will receive 10% extra credit on your test.